This article will help you understand how ribbon is structured in Sitecore and how to add custom buttons into this ribbon. I have used Sitecore 9 to demonstrate this functionality (hence the title of the blog post) but I believe, based on my previous experience with Sitecore 7 and 8, that ribbon is working in the same or at least in very similar way also in previous versions. Although title says “social buttons”, this post will help you to create any button in Content Editor. 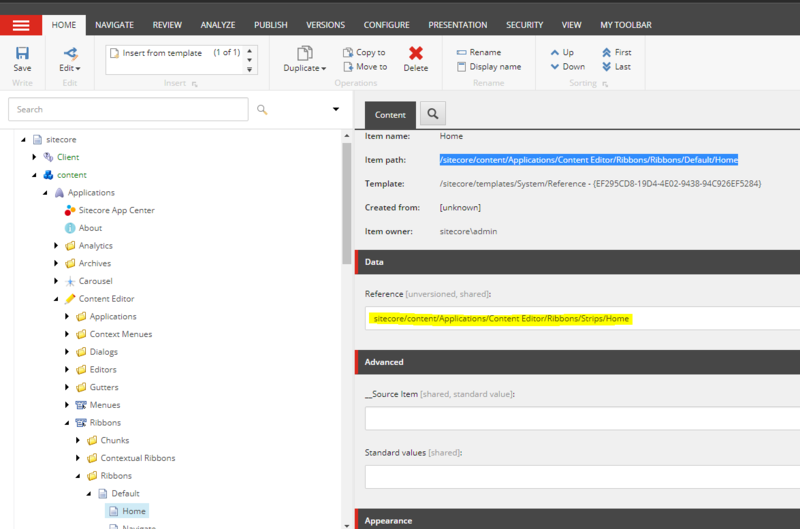 I have just demonstrated the steps on real requirements as in Sitecore 9 (as of publishing this post) there is no Social Connected module integrated anymore. Take a look here for further details. To make any changes to Sitecore Ribbon you need to be in “core” database. To begin with, let’s describe structure of Sitecore Ribbon. Sitecore ribbon contains toolbars, strips, chunks and buttons. In Sitecore there is actually only one Ribbon – Default. Remaining Ribbons are so called “contextual ribbons” which means that they are shown only for certain templates. 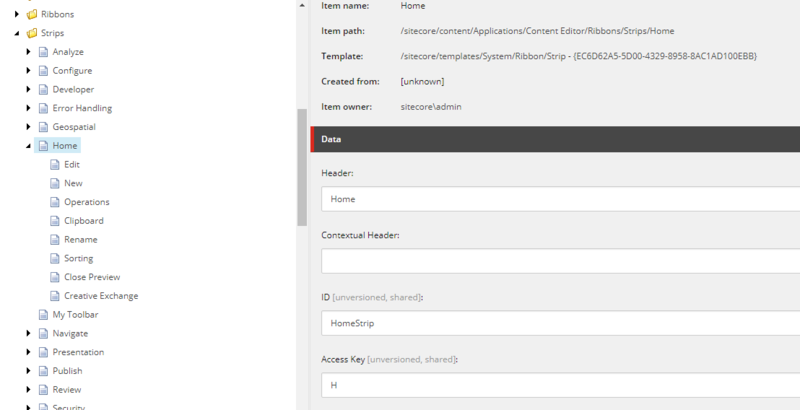 For more information about ribbon in Content Editor and how to customize it from content editor perspective, take a look on this nice article in Sitecore documentation. It contains several tabs / toolbars – HOME, NAVIGATE, REVIEW, and so on. You can see there reference to it’s corresponding strip. Each Toolbar contains only one Strip. Strip contains several chunks (toolbar sections). Each strip is defined in core db under /sitecore/content/Applications/Content Editor/Ribbons/Strips item respectively. Chunks are toolbar / strip sections which host buttons. They are divided between each other by vertical ruler. Home Strip contains several chunks – Write, Edit, Insert, Operations, Rename, and many more. You can see title of chunk on the bottom of each with grey color. Each chunk is defined in core db under /sitecore/content/Applications/Content Editor/Ribbons/Chunks item respectively. You can see there also child items (Rename & Display Name) that define reference to buttons which chunk contains. Most important part of ribbon are buttons. Buttons can trigger some functionality after clicking on them. Each button is defined in core db under it’s Chunk subitem /sitecore/content/Applications/Content Editor/Ribbons/Chunks respectively. Button look and feel, functionality and options are determined based on it’s template. After introduction on how Sitecore ribbon is structured, let’s take a look how to add some custom button(s). This will also conclude blog post about social sharing capabilities in Sitecore 9 as Social COnnected module is not available for this newest version of Sitecore. I will use Contextual Ribbon for specific template. Adding button to regular Ribbon is pretty similar but you need to follow structure described above in chapter 1 instead. As you can see, we are referencing “control:FacebookShare” in the command. This is effectively opening modal dialog (by calling SheerResponse.ShowModalDialog method) with given url which is url to FacebookShare control. Mind the control>FacebookShare hierarchy in xml. This is how Sitecore can find this control for our command. I have created Base class for all Social Dialogs under Dialogs.Base folder. /// The <see cref="T:System.EventArgs" /> instance containing the event data. /// the <see cref="M:Sitecore.Web.UI.Sheer.ClientResponse.CloseWindow">CloseWindow</see> method. 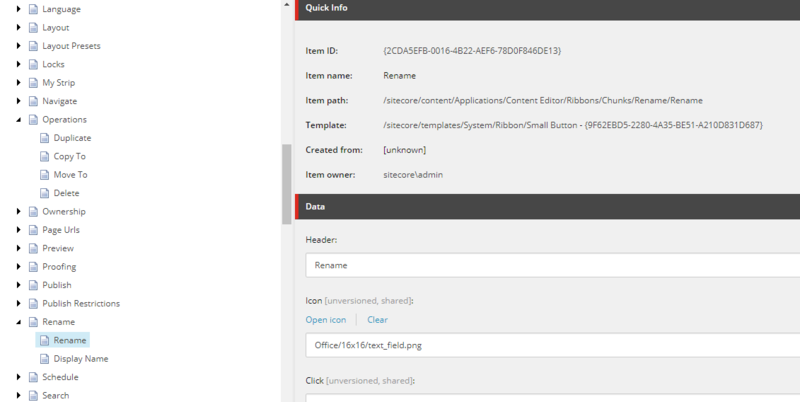 We have created _Shareable interface template with these fields Title, Image, Short Summary and Text. We have set this interface template as base template to our desired one. Same applies also to LinkedIn.